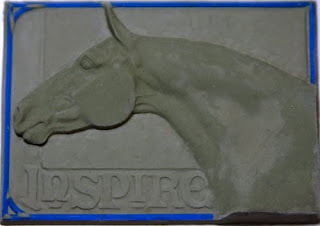 “Inspire” is almost done. He still has a few bald spots (still trying to decide the best direction for those strands) and I need to add the inner curve to the top right border, but I am so close. I probably won’t post again until there are glazed versions. Not that there’s much surprised left to him, after so many detailed posts about his creation! And as many of you who have followed this blog for a while now have already figured out, I am utterly incapable of multi-tasking. It is really difficult for me to put a project down and pick up another. So everything in the studio ground to a halt while I worked on this sculpture. That meant that I didn’t get my claybody custom photographed and loaded up to the Auction Barn before the holidays. I fear I missed my window, since many people find it hard to bid on items close to Christmas. I think I will hold off on the auction for a little while, but I will try to get her pictures up. She’s too cool to hide away just because I got distracted. It wasn’t just the studio that has suffered from my obsession. The holiday baking hasn’t been started. My family is beginning to wonder if I plan to feed them, or just show them a few more strands of clay horse hair! 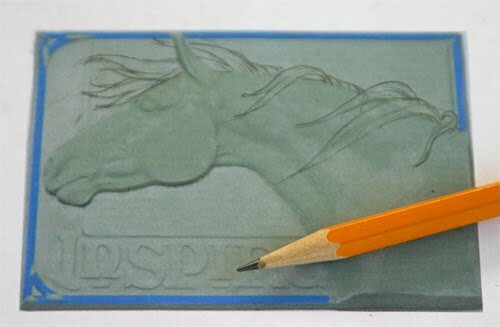 This means the original goes through two shrinks; one when it is cast and made into the background for the new original, and a second when the final casting were made. What I’ve learned from shrinking down originals to create smaller versions is that there is a certain amount of distortion that amplifies with multiple castings. I wasn’t confident that I could just enlarge my design 12% to account for the two shrinks, and still come up with the required trading card dimensions. That and my unwillingness to sculpt manes on a soft surface was a limitation I needed to overcome. I needed a new approach. 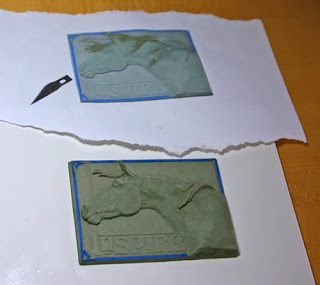 I decided that part of my problem was trying to design on the fly on the non-hardening clay. I needed to do more of my design work on paper before I approached the clay. So what I did was take a picture of the hairless design (that’s the picture at the top of this post) and print it out in actual size. I also dropped the opacity of the image to 70% so I could better see the lines I would draw. From there I started sketching in the mane. These weren’t the general direction lines I had used before, but a blueprint of exactly where the strands would fall. My goal was to confine my redesigning to erasing pencil lines, rather than removing clay. But even more so, what I wanted to do was more accurately replicate the feel of my linework in my sculptures. 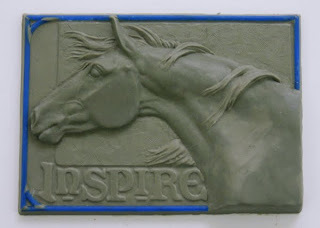 My drawings have always had a softer, wispier feel that I had wished was more evident in the manes and tails of my sculpting. The sculpted versions always looked clunky in comparison, at least to my eyes. I thought that perhaps if I drew something specifically intended to be sculpted from, I might begin to see what was getting lost in the translation. Using the drawing, I sculpted exactly what I had drawn directly on the printout. After the basic shapes were in place, I used Goo-Gone and a paintbrush to smooth the surfaces. This was a leap of faith because I had foolishly not thought about the possiblity that the solvent might melt the ink (or the paper) until after I started brushing it on the surface. Surprisingly, Goo-Gone doesn’t do anything to ink jet printouts. Obviously the strands aren’t in their final, polished form. All I really wanted was to capture the larger shape and movement. Once I had that, the paper and clay were all placed in the freezer. I had used NSP Soft so that it would blend well (and not take a lot of tool pressure to detail) once it was added to the horse, but that meant the clay was much too soft to maintain its shape without freezing it first. It worked! 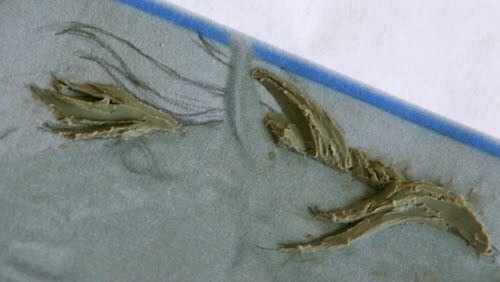 It took a while, but a day later the bits of mane were stiff enough to pop off the paper backing. 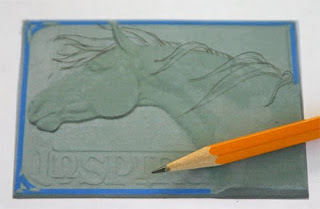 It was a bit like placing little mane stickers on the horse. Here are the first handful of bits I placed sitting on the rapidly defrosting horse. I eventually put them all in place, but the design was too cold for them to stick. I had to let it thaw a little first, then gently press them down. The mane still needs a lot of cleaning up and detailing, but it’s all in place. 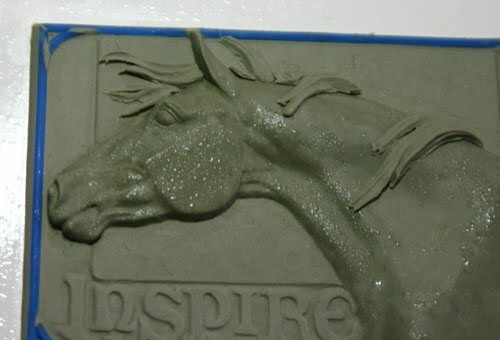 The whole design, with all the mane bits, is back in the freezer for the moment. I need everything to firm back up so I can do the final shaping of those mane pieces. 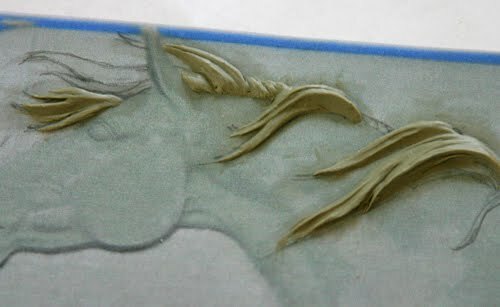 After that it’s just a bit more detailing of the strands and I’ll be ready for the final pre-casting inspection.